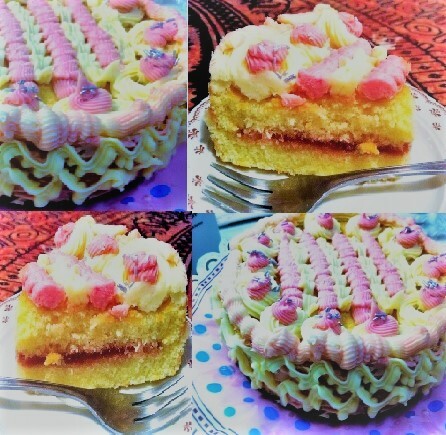 Angel Cake is just another name of the Sponge Cake made with the same ingredients, also very well known as the English Cake. Angel Cake has layers in two Colors and i used them in my icing and i did not fill it with cream, instead that i used the Raspberry Jam. 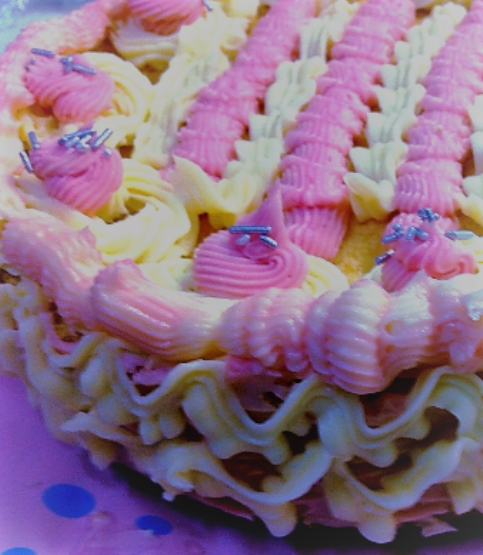 The main taste is of the icing no doubt, as it’s mainly with castor sugar and a mix of butter in it. I remember we used to eat these bars so very often in our childhood, These are normally in a rectangular shape, i happened to eat this in England two years back, to just recall that taste of childhood, it was tasty but of course it’s never the same then. The main secret of a good sponge is always the beating time. This cake was so spongy till day 4, till the cream started turning a bit softer but the sponge did not harden a bit. So if you crave for just one piece of cake you can make this, it gives you like 6 pieces. There is no baking agent in this cake, no baking powder nor baking soda! Add those 2 tbs of corn flour in it….. Tada you have your cake flour! It is Important to sieve this 5 times, yes exactly 5 times! -Then add the sieved cake flour slowly and just FOLD all DO NOT BEAT. Now grease a 15 cm pan and lay a round parchment paper on the bottom and pour the batter into it. We all loved it as you feel the real cake taste and not just the heavy cream.